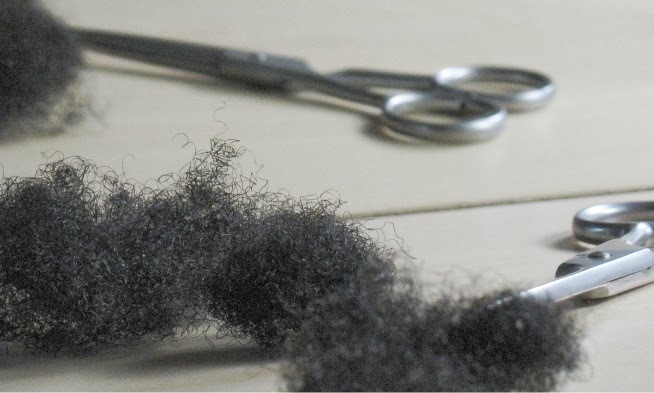 THE NATURAL HAVEN: Investigation: Does pH affect your hair cuticle? Investigation: Does pH affect your hair cuticle? So............pH is the topic du jour! Specifically the alkaline pH that you can find with shampoo alternatives such as castile soap, shampoo bars or baking soda. Q1: Does pH raise or close cuticles? There are two authoritative studies on this with pretty similar results. There is very little change to hair structure between the pH ranges of 4 to 9. Hair protein resists changes due to acid or base. Tests were performed using hydrochloric acid (powerful acid) and sodium hydroxide (a strong base). Q2: Do the cuticles not open at high pH? I insist on using correct terminology. 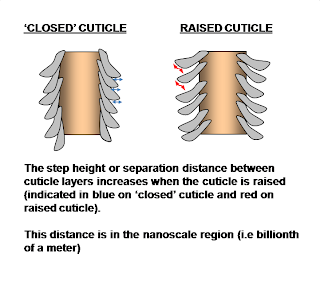 The cuticle is not a door that can open and close. It is a protein whose structure can be affected causing it to lift. Yes the cuticle does lift around a pH of 10. Q3: Are you really saying that hydrochloric acid and sodium hydroxide really do not affect hair? In the range of pH 4 to 9 yes, there is not much change to hair. In fact soaking hair in water (yep plain ole water) for a long time (circa 10 minutes is long) actually yields greater change to the step height (see above) than acid or base. Q4: What happens outside the pH 4 to 9 range? At both low and high pH there appear to be structural changes to hair causing it to become more dense. This is thought to be a result of the acid or base changing the protein.Very high pH can actually dissolve hair. 3. Is pH sufficient to relax hair? 4. Q&A regarding use of castile soap and baking soda - should you really use them? Is it okay to add a question? Does the ph of your hair affect your hair's porosity? You know, the ability for it to hold water for long periods of time. I use porosity bi weekly and I feel like it's really helping with my hair ability to hold moisture my hair never felt so soft. Even my ends are amazing! Thanks. This is great information. I'm so excited by the questions you will be examining next. Hmmm...so what's happening around pH 2? That's about where lemon juice falls, right? 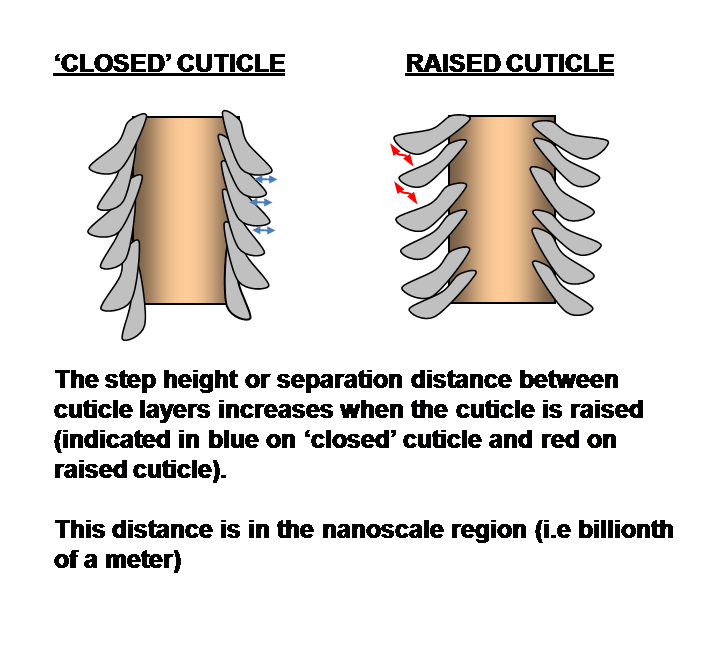 I know that you did a post in the past saying that the cuticle cannot be closed with an ACV rinse (pH 3). But, what is the end result of the "structural changes" that occur at low pH? I hope my questions are not a pain! Your posts make me excited to turn my laptop on in the morning! @anon and little one - the answer is there isn't research about it. From these two papers, the only ones that directly test hair structure with pH variance, the only indication is that the structure of hair definitely changes because density changes. This is most likely because the acid is reacting with hair, changing the structure of the fibres (fibrils) of the cortex and making them more compact. Is this good for long term stability and strength? Most likely no. However there is no definite answer, all that is known is that the hair density changes. So JC, this is what I understand from this. If you do a rinse... or use a product.. in the ph range of 4 or 4.5 to 'close' your cuticles. Then you really aren't 'closing' ur cuticle because the cuticle is raised about the same distance as if you were using a liquid of 9 ph.. or just water @ 7 ph? Is this correct? I made a did a conditioner mix to have a ph 4 leave in and i noticed a instant difference that i never experienced before. My hair was smoother easier to detangle. I used plain aloe vera juice (ph 4)and it was even better. Never experienced that before and my hair is 4C. tha smoothness last for days. Dunno but it seems to work. The indredients i used for the mix never gave me that result before. The aloe vera juice was the only new ingredient. Spot on Skeeta, the cuticle is pretty much the same at pH 7 as it is pH 4. I can't blame you. I was very tied to porosity for such a long time (as recent as three years ago). Starting this blog has made me revise a lot of things. I am for sure coming back for the next round of questions! Kadiane - Interesting! Aloe vera juice is a humectant and I've definitely heard Milan over at agrlcanmac sing the praises of aloe vera. I have used aloe Vera GEL before and i hated it. I still hate it. If is was only the effect of humidity i will not have loved the juice because excess of humidity is my current problem du to the weather.I know it is not the humidity but i'm aware of the contradictions. I appreciate your input and it makes me want to try the other acidic products to see if i get a similar result. If i don't then i can say it has to do with the marvels of aloe Vera JUICE . I'll let you know. Jc, I hope you never close this blog because I love referring back to specific topics. What a great resource. What brand of aloe vera juice/gel should I purchase? It is hard to find one that is organic or pure!